Home baked cakes in bangalore - Birthday, Custom cakes.. Whom do you contact when you want a customized fondant cake with your son or daughter’s favourite cartoon slapped across it? When you want to celebrate anniversary with your loved ones? When you need some chocolate truffles to spell out a special birthday message? 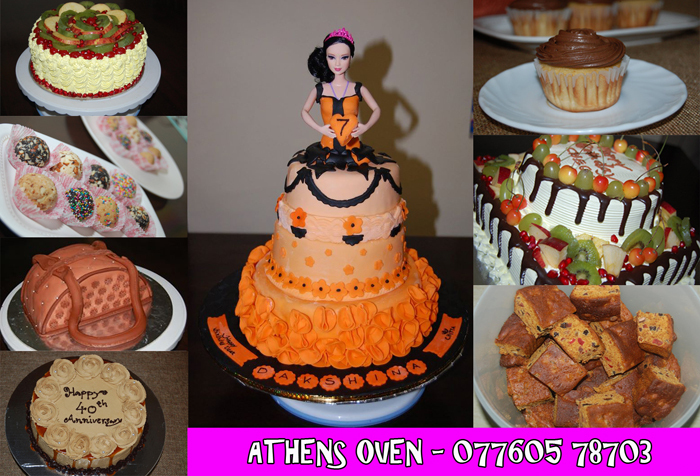 Run by the highly qualified baker & teacher Athira Sooraj – Athens Oven is your answer for any type of customised home baked cakes or cupcakes in Bangalore. Athira can pretty much work with whatever crazy and creative ideas you have in your mind – whether it’s a movie character or something else. She is baking cakes not for business. Its her passion and love towards baking and you can feel this love in every bite. More than that she never uses any added preservatives and all her cakes are healthy and tasty. She also runs cake baking classes for the novice or beginners in Bangalore. She is a judge for many baking competitions also. So whether you want Mocha filled with chocolate ganache, Assorted Chocolate truffles, Ghee cakes, Cheese cakes or Fondant cakes think none other than – Athens Oven and make your special day memorable with the cakes filled with love. This entry was written on November 29th, 2015 by Renoos. Posted in Reviews and was last revised on April 5th, 2018.